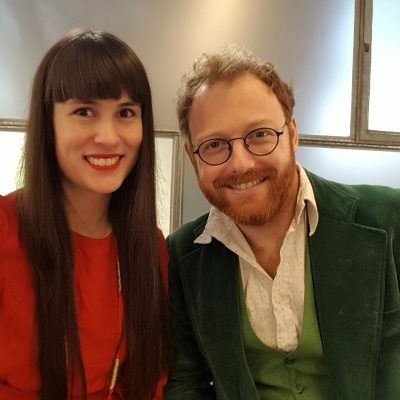 Pratchat is a monthly ‘book club’ podcast hosted by Elizabeth Flux and Ben McKenzie that aims to discuss every Terry Pratchett novel ever written. Each episode, Flux and McKenzie are joined by a special guest to dive into one of Pratchett’s works, and line-up has included comedian Cal Wilson, Guardian Australia deputy culture editor Stephanie Convery and author David Astle among others. Flux and McKenzie spoke to Books+Publishing for our ‘podcast spotlight’ series. Elizabeth Flux: Pratchat is a monthly book club podcast where, each episode, the two of us and a guest meet and discuss a Terry Pratchett book. Each episode is standalone and we avoid spoilers for the rest of the series so people can either listen chronologically or dip in and out. EF: Our big goal is to cover every book Terry Pratchett wrote—so not just his ‘Discworld’ series (Corgi), but the supplementary books, the co-written novels, and perhaps even the satirical children’s picture book Where’s My Cow? (Doubleday). It’s ambitious—and we estimate it should take us around six years. Ben McKenzie: I have always loved audio, listening to stuff like The Hitchhiker’s Guide to the Galaxy and The Goon Show when I was a kid, but never had any idea about how to get into radio. When podcasts arrived, I was always keen but wasn’t sure how to start. Then in about 2012, I appeared as a guest and then regular ‘fact checker’ on the long-running television podcast Boxcutters, hosted by (among others) Josh Kinal and John Richards. John and I became good friends, and decided we wanted to work together more; my background in live performance and his in podcasting, plus our mutual love of Doctor Who, led to the birth of Splendid Chaps, a year-long live podcast series celebrating the 50th anniversary of Doctor Who. I learned a lot doing Splendid Chaps about editing, producing and publishing podcasts. Although the audio side was almost entirely handled by sound engineer David Ashton, I researched how to host a podcast and get it published in podcast directories and so on. I ran that side of things, as well doing a little field recording and editing of shorter interview episodes from festivals. That project was always meant for a limited run, though we’ve returned to it a few times (and will again), but I always knew I wanted to do another podcast. EF: Staying true to the book club nature of our show, we meet each month at Ben’s house and sit around the kitchen table drinking tea and discuss that month’s Pratchett. Our team is small—just two people—though every episode we ask for questions from our listeners so the show itself is shaped by a much bigger hive mind. BM: From a technical perspective, we use an AudioBox digital interface connected to a MacBook Pro, and the Digital Audio Workstation (DAW) software Reaper, which is a cheaper alternative to something like ProTools. At the moment we’re using SM58 mics with table stands and pop filters but I’m hoping to upgrade to something more specifically suited to podcasting soon. EF: We were actually quite surprised at the reach the show has been getting. We assumed at first that it would be mostly die-hard Pratchett fans like ourselves, but it’s been really fantastic hearing from people who had been on the fence about diving into the ‘Discworld’ series, or who had only read one in the past and then decided to give the books another crack after listening to an episode. So it’s a mixture of long-term fans and the newly initiated! EF: It’s impossible to pick, because each one of our guests brings something completely new to the (quite literal) table—but Cal Wilson holds a special place in our hearts. Not only was she in our first episode, but she’s our only guest to have featured twice (so far). We try to pair guests with the book they either have the most affinity for or have strong opinions about, so it was great having crypto cruciverbalist David Astle come in for our Dodger episode to help us pick apart Victorian-era English. We also recently covered a book with an illustrated edition, so comic-book creator George Rex was able to offer us her perspective on the artwork in the book. BM: The rise of podcasting networks—which are now becoming more common within Australia, and not just in the US—has meant a lot more slickly produced, advertising-supported podcasts which can make it daunting for content creators to get started in the format. So it’s good to see some simpler conversational podcasts still doing well. The Australian industry has always been dominated by this format, probably because we have a tradition of podcasts hosted by comedians on tiny budgets! I’ve also really enjoyed the recent rise in the number of scripted drama podcasts and it’s been great to see local shows in that vein, like Love and Luck. EF: Freedom and flexibility—it gives you more options than a lot of other media. As much as we love books, when you’re reading one, that’s all you’re doing. Same, mostly, with watching TV. Podcasts can fit in around the gaps of life more than other storytelling methods—you can sit down and give them your full attention, or you can listen while commuting, or cooking, or cleaning, or any other daily activities that have room to be enriched. BM: I think the fact that podcasts can survive with much smaller audiences than other forms of media means that they can also get really niche, which means people can find podcasts that really cater to their interests. Just like there’s a fan site for everything on the web, there’s a podcast for everything too. EF: It’s a relatively new show—we’re seven episodes in and now that we’ve found our feet, we’re starting to turn our attention to some of the bigger ideas we laid out in our initial planning stages. We love what we’re doing, but we want to make it as accessible as possible and to keep doing it for the next six years, so we’ll look into the best way to do this. BM: It’s a long-term project and we have some big plans, so to keep ourselves going for that long, we need to look into ways of making it sustainable. That might mean live shows, which can be ticketed as a source of income—that’s how Splendid Chaps worked—or it might mean a form of crowdfunding or subscription, like Patreon. But we want to make sure the podcast itself is always freely available, and I don’t think we’re keen to have advertising—not that we have the audience to make that viable yet anyway! EF: There are some big Pratchett milestones coming up, so we have ideas for special episodes and live shows. We also have a few other plans in the works, but we’re going to have to keep quiet on those at this stage. What other book-ish podcasts should we be listening to, Australian or otherwise? BM: Pratchat has only just reactivated the reading centres of my brain, so I am still investigating book podcasts! I do have a few to recommend though: Galactic Suburbia is an Australian show about speculative fiction in all its forms, including books. The hosts often have contrasting opinions, which makes for great listening. Joel Martin and the team at The Morning Bell do great work interviewing different writers from various disciplines (we’ve both been guests), and I really enjoy that it always starts with general chat before getting on to the literary topic of the episode. The Wheeler Centre’s output is amazing: most of their actual podcasts aren’t about books, but they do publish videos of most of their talks and interviews, which are always worth a watch and a listen. Two of my long-term listens are from overseas and are book-adjacent: The Allusionist is about words and language and hosted by the enthusiastic and delightful Helen Zaltzman and Jay and Miles X-Plain the X-Men guides novices and fans alike through the continuity spaghetti of the entire history of X-Men comics. I also loved their spin-off series covering Walter Simonson’s run on The Mighty Thor, which was called THOR: The Lightning and the Storm. To have upcoming interviews delivered straight to your inbox, and stay up-to-date with Australian book-industry news, sign up to our Weekly Book Newsletter. To get full access to Books+Publishing’s features, news and interviews, purchase a subscription here.